La Macina is a stone country home set high on the hills overlooking the Mediterranean sea with its endless shades of blue. 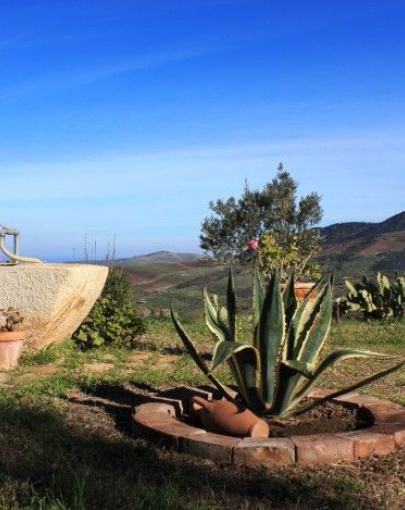 Placed above the village of Aliminusa, La Macina enjoys a very private and secluded position with panoramas stretching 360° round and yet is a mere kilometer from amenities. Outside is a large garden hosting an ancient millstone, hence the name '"Macina'" an inviting fruit orchard and a vegetable garden guests are welcome to use. At the back of the house sits a lovingly tendered vineyard and olive grove. The house develops over two floors. The groud floor hosts a spacious kitchen tiled with colourful local ceramics, a full bathroom and a welcoming lounge with fireplace, sat tv, hi-fi system, 2 armchairs and a sofa-bed. Off the lounge, an elegant wooden staircase leads to the first floor. Here are two single and one double bedrooms enjoying magnificen views. Outside the kitchen a wide pergola hosts a wood oven and a table seating up to 18 guests - very reminiscent of Sicilian feasts! All in all we really liked this place for its genuinity, the attention to detail, the marvellous views and the lovely people in the village. You can't miss a visit local farmers who produce fantastic sheep and goat cheeses as well as the famous sheep's ricotta, traditional remedy to any ailment! The house is owned by Francesca and Rosolino of Borgo La Chiusa in Siena and managed by Francesca's parents Pina and Salvatore, who offer genuine, warm, careful attention yet respect the guests' privacy, just like at La Chiusa. Pina is a marvellous cook and does embroidery (traditional craft), Salvatore farms his land and looks after the grandchildren. They live about 2 kms from the house and are at hand should you need any help. Pina will make sure you always have enough food from Salvatore's garden, and is willing to prepare frugal feast with fresh pizzas, traditional Sicilian dishes at a very smbolic price. Down the road Pina owns a simple village house sleeping up to 6 guests with 2 bedrooms and two bathrooms, ideal for a large family and friends holiday at very honest pricing. 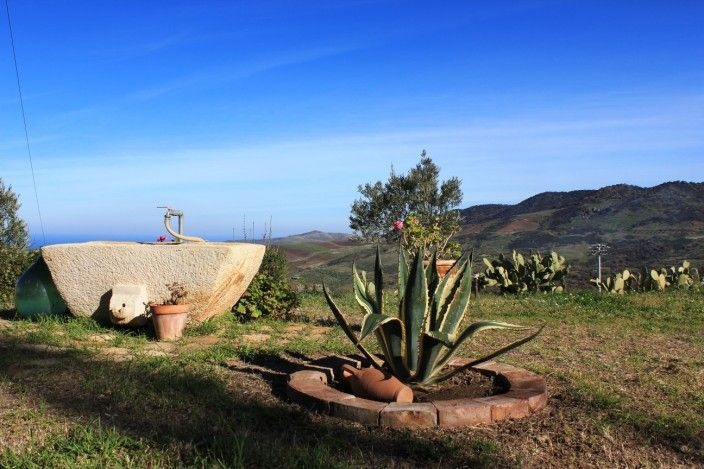 Holidays at La Macina and Aliminusa offer the possibility to experience authentic Sicilian living, and enjoy peace, quiet and cool breezes especially in July and August when the beaches are crammed with tourists and the temperatures rise. The house is only 20 minutes drive from lovely beaches.